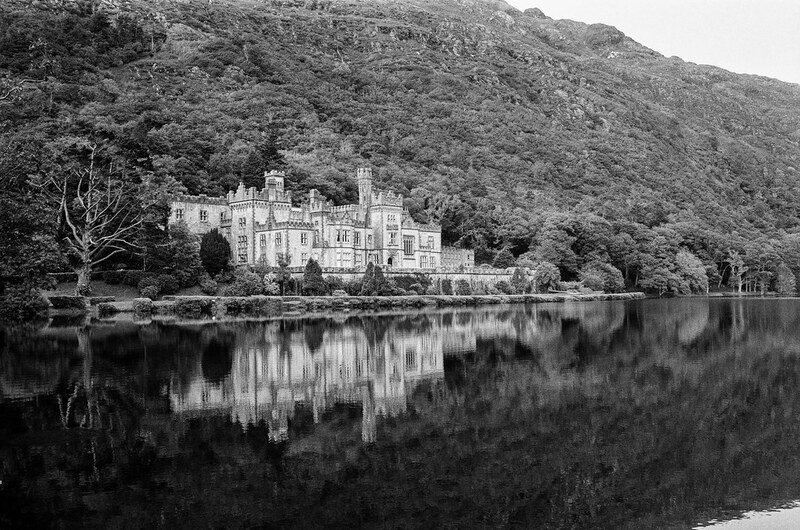 Ireland is a country of color — especially green, in astonishing shades across its rolling countryside. 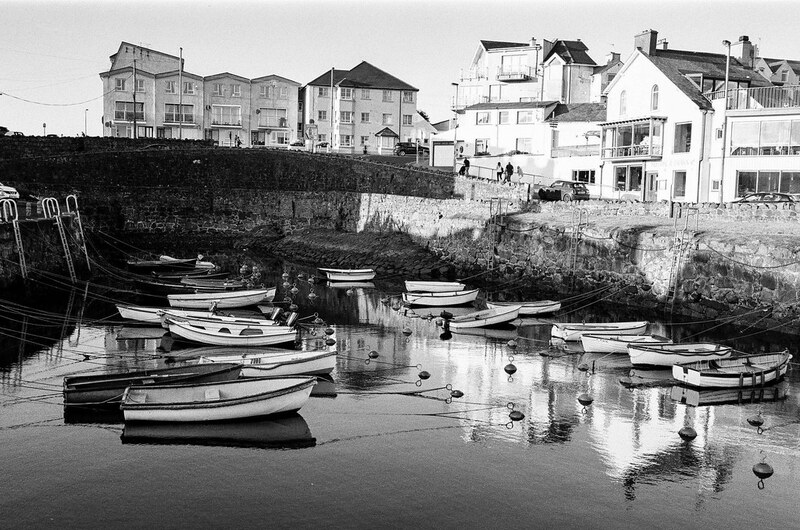 Yet I shot black-and-white film all over that country, looking for light and shadow. What I got was a set of images with such texture that you want to touch them. When you do, you’ll be surprised not to feel the textures in your fingertips, as if they were pressed into the pages in relief. 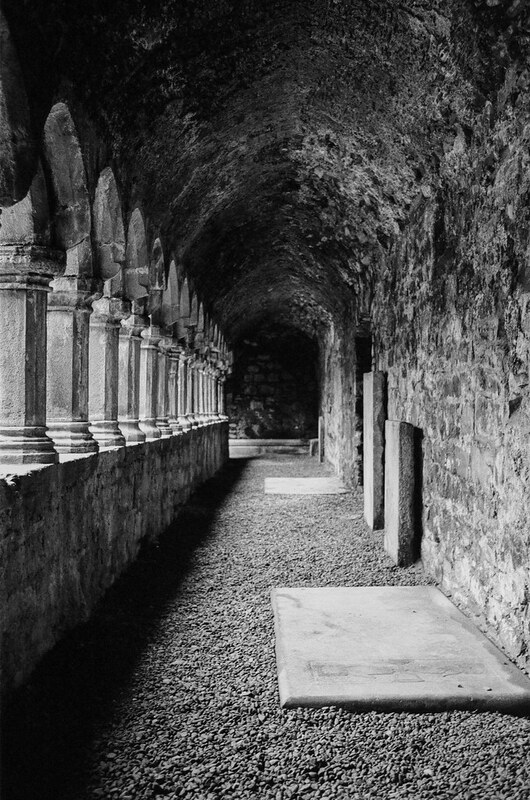 My new book, Textures of Ireland, shares the best of my black-and-white photographs. 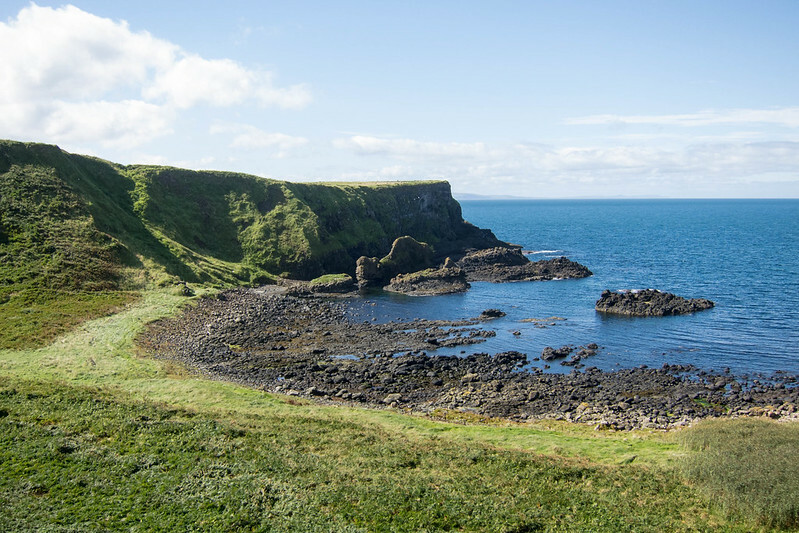 You’ll see scenes from Northern Ireland in the region where the show Game of Thrones is filmed, country scenes from Ireland’s rich northern and eastern counties, as well as ruins and modern architecture from cities and towns. I’m offering my book in two ways: a traditional paper book printed on demand at Blurb.com, or as a PDF. The PDF is the fastest and least expensive way to see my book — but the textures come out best by far in print. I hope you’ll buy a copy today! 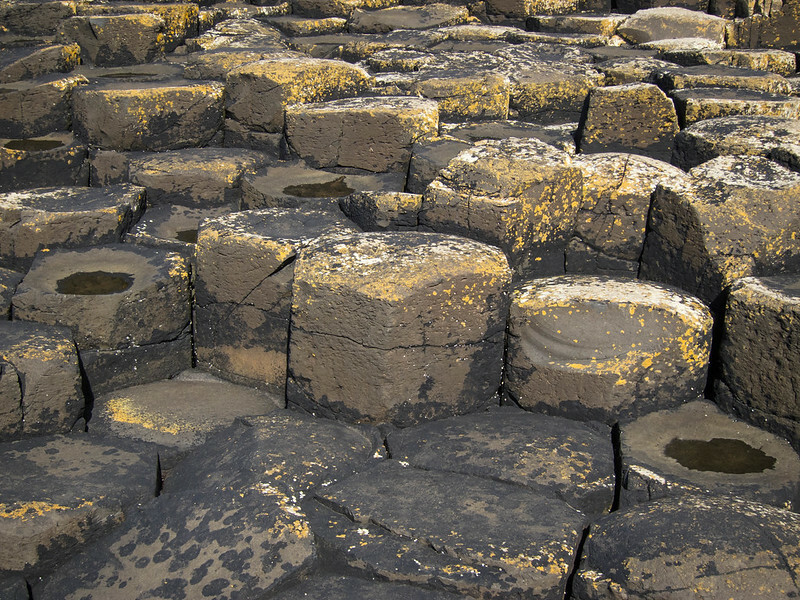 Textures of Ireland by Jim Grey, 36 pages, published via Blurb.com. 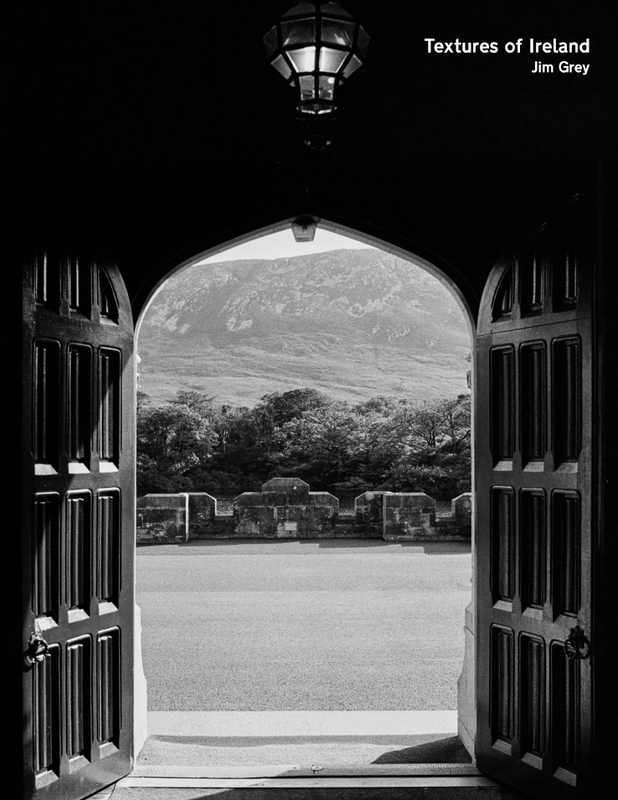 I’m almost done telling stories and showing photographs from our trip to Ireland. I’m feeling a little nostalgic for the stories I told of our trip just a few months ago! 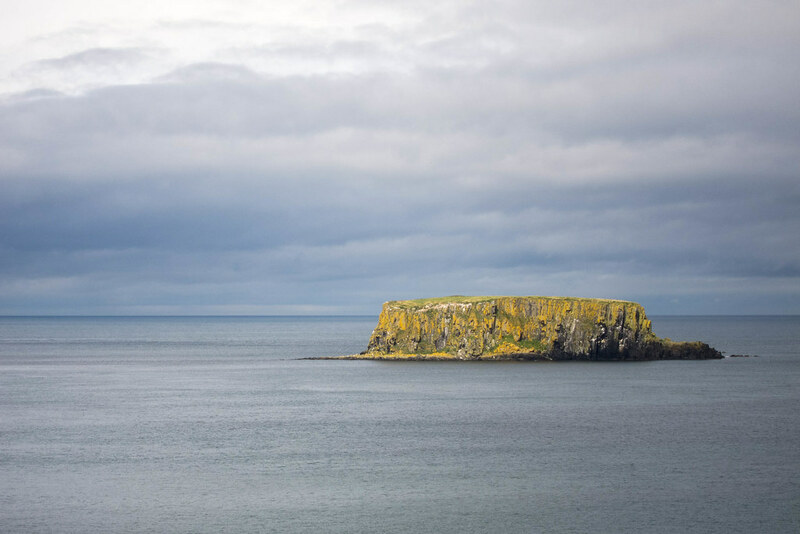 So here’s a photo from Carrick-a-Rede, which we saw in our first days in Ireland. 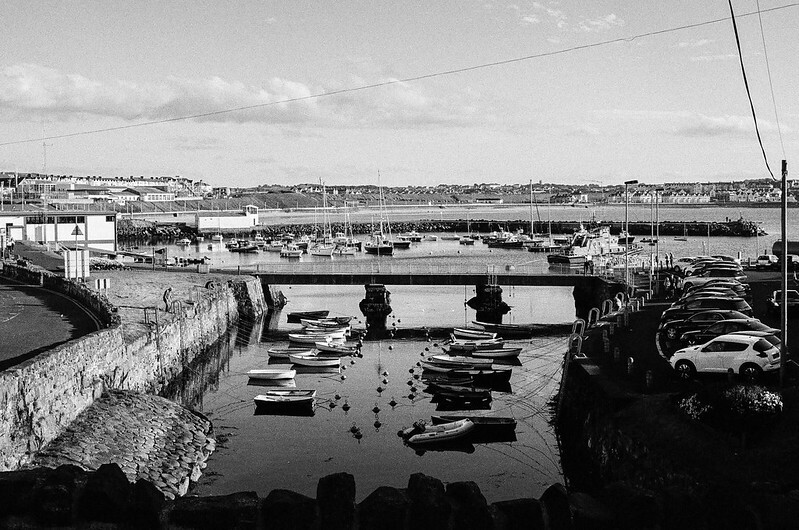 Our day along Northern Ireland’s Atlantic coast brought us near the home of fellow film photography blogger Michael McNeill. 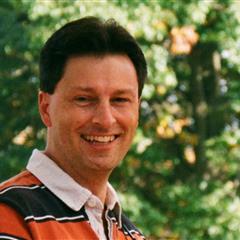 He writes the North East Liberties blog, which is named for the area of Northern Ireland that Michael calls home. 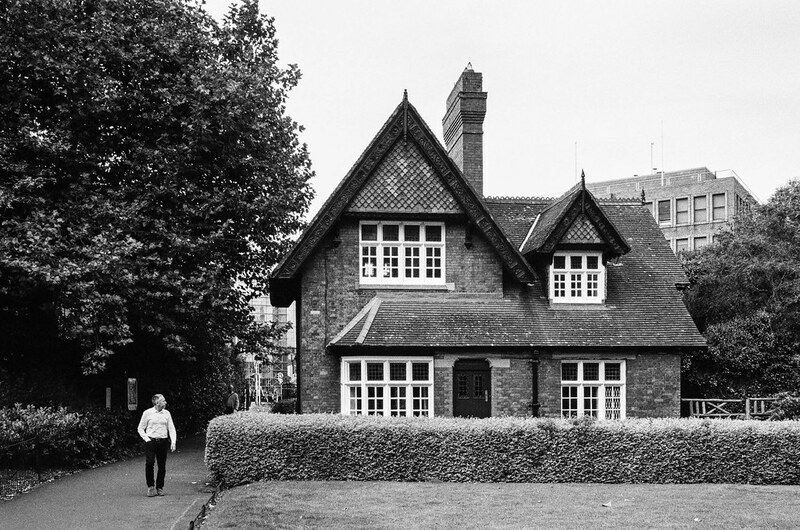 When he read here that we were coming to Ireland, he wrote to offer a meetup. We made it happen. Here we are, me with my Nikon N2000 slung over my shoulder and Michael with his pristine Nikon FE2 (I think it was) slung over his. 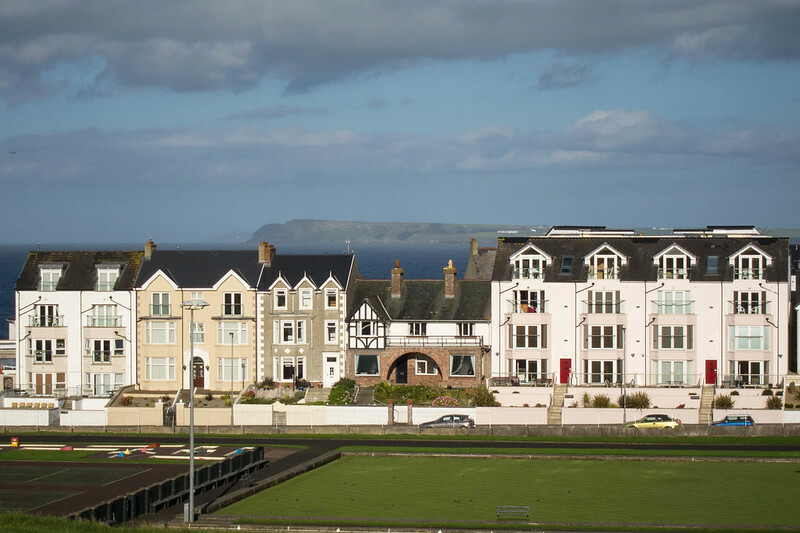 We met in Portrush, a holiday town just east of The Giant’s Causeway, from where we had just come. We met at the beach and walked to a little shop for tea. I announced my American-ness straightaway by taking mine black. Michael and Margaret poured on the milk. Tea consumed, the getting-to-know-you conversation was going well so Michael suggested a stroll along the beach and up the little peninsula that comprises most of the town. I photographed this scene which I’m sure Michael has contemplated through his viewfinder many dozens of times. A little harbor rests about halfway up the peninsula and provides obvious photographic opportunity. But I didn’t take very many photos on our walk, actually. I’m sharing everything I shot in this post. The conversation was good and it seemed a shame to pause for too many photographs. We walked a trail up to the peninsula’s tip. Michael says that he often drives up here with his dog for walks. 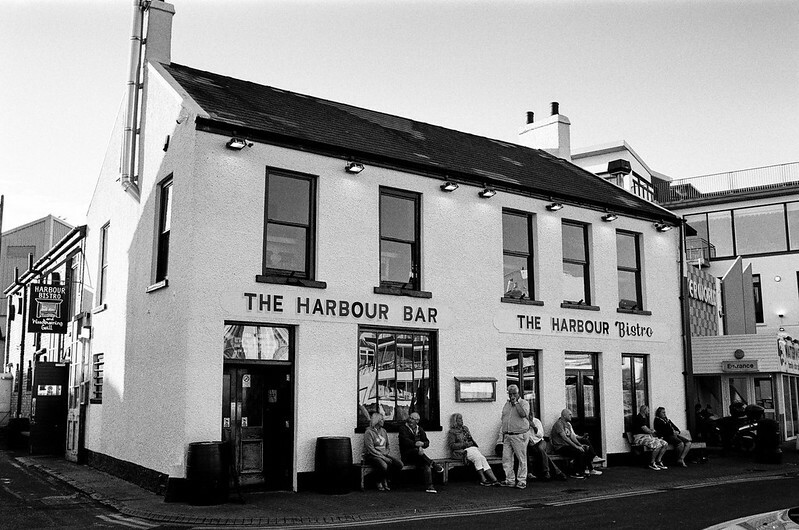 “If anyone knew I had friends in and didn’t take them to the Harbour Bar, I’d never hear the end of it,” Michael said, and with that, we popped in. A restaurant takes up the back, but up front is the kind of Irish bar you’d expect to see in a movie: crowded and spare, full of dim nooks and rough wooden tables. It’s an old bar, the oldest in all of Ireland. My stomach was out of sorts, so to my dismay and disappointment I had to decline the half-pint of Guinness Michael offered. But Margaret and Michael both enjoyed one, and our great conversation continued. Margaret and I figured we’d meet Michael for a quick cup of tea and be on our way, but we had such a lovely time that we stayed in Portrush for a good three hours. We parted where we met, at the beach. Do follow Michael’s blog (here). He is dedicated not only to black-and-white film, but also to the art of darkroom work and printing. I believe most, if not all, of the photos on his blog are scans of his prints. Color landscape: Canon PowerShot S95. When lava cools rapidly, it creates a dark gray rock called basalt. 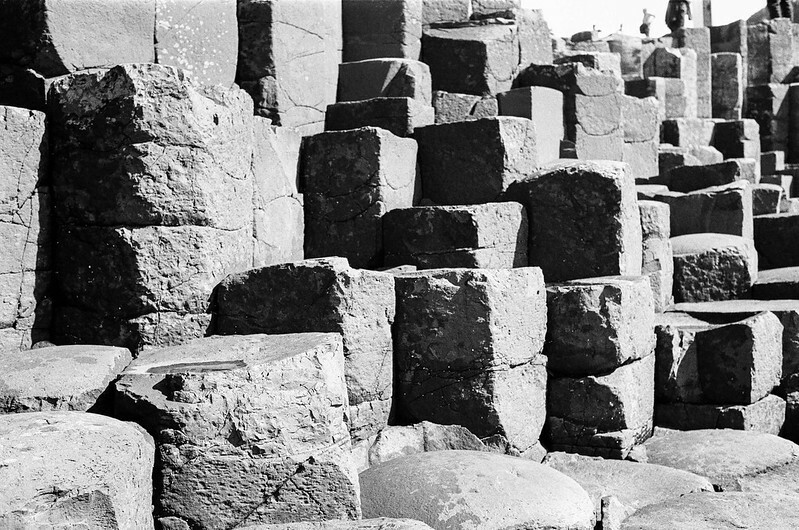 In some places around the world, ancient volcanic activity led to basalt in perfect hexagonal columns. 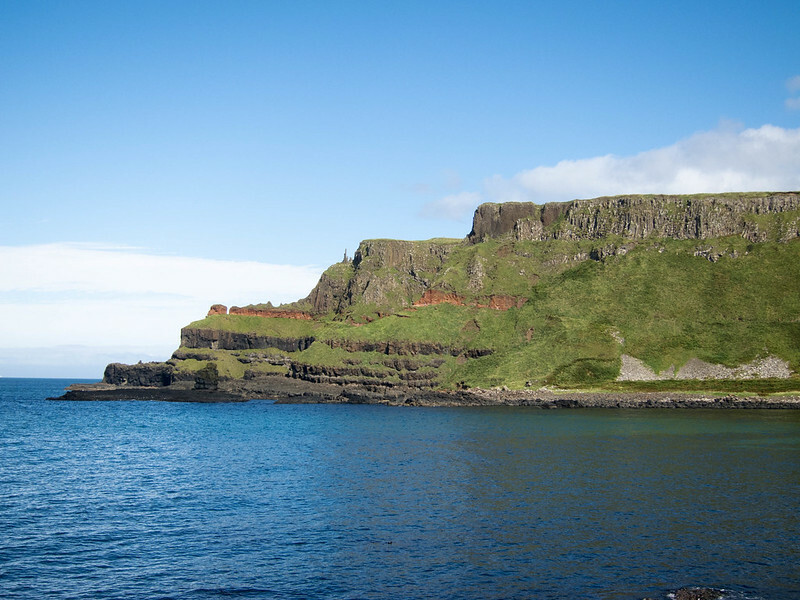 One of those places is on the North Atlantic coast of Northern Ireland, a place called The Giant’s Causeway. 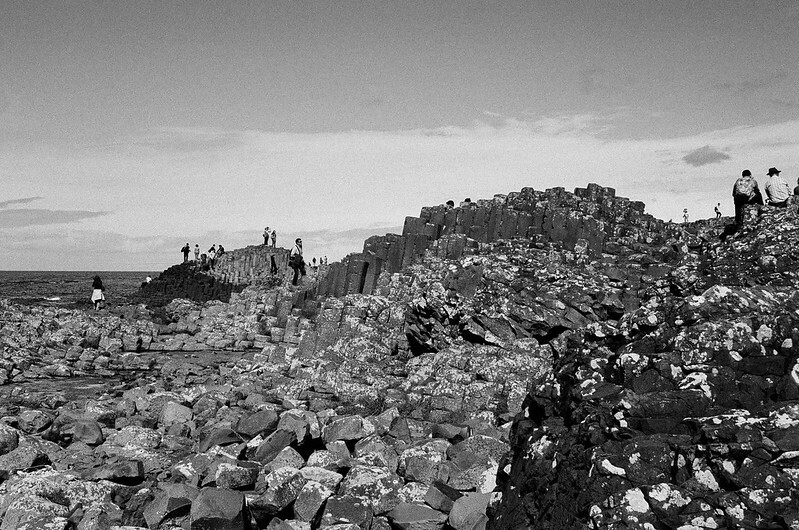 It’s thought that volcanic activity here more than 50 million years ago formed this basalt. 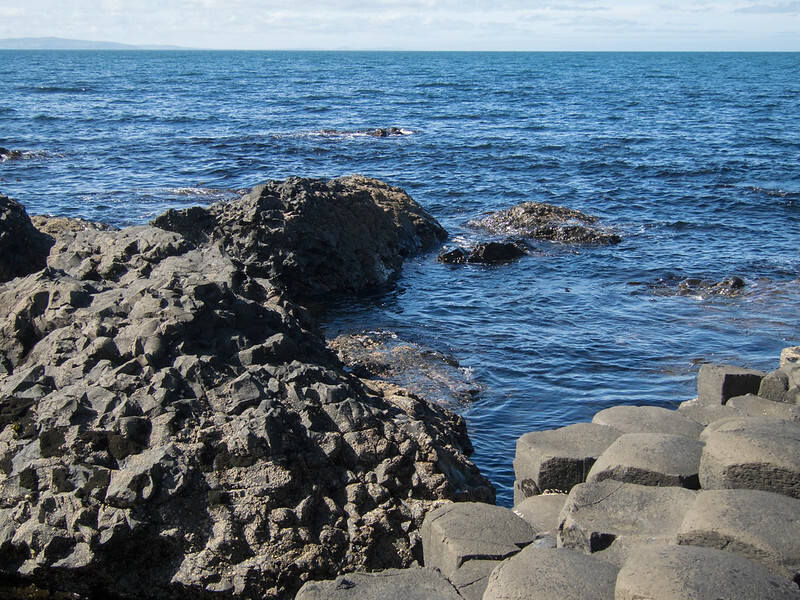 But ancient Irish legend holds that a giant named Fionn MacCool, when challenged to a fight with a Scottish giant, built this causeway so that the two giants could meet and battle. 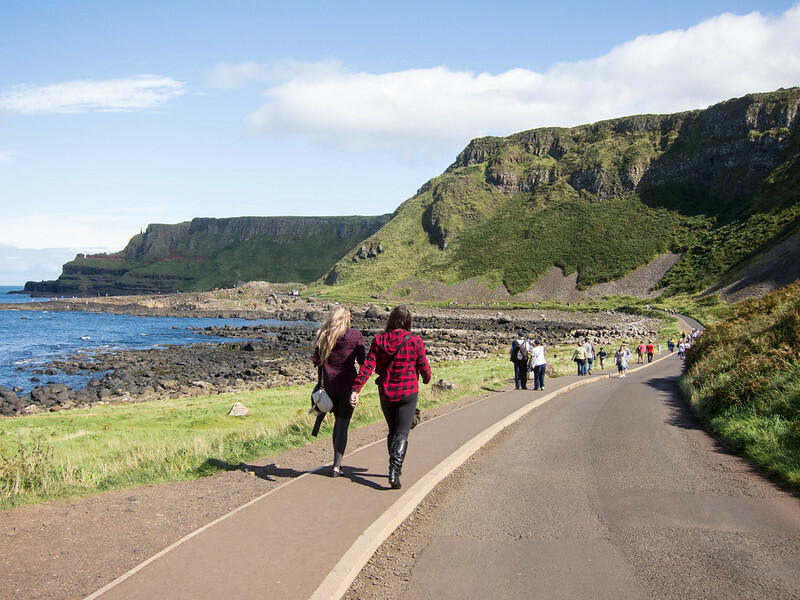 The Causeway became known to the world in the late 1600s, and became a tourist destination during the 19th century. On the unusually sunny and warm September day on which we visited, hundreds of others climbed the columns with us. I hear it’s pretty much always busy, as one of the leading tourist destinations in Northern Ireland. Oh, let’s switch to color, shall we? Because the ocean is startlingly blue here. Really, the views are all breathtaking, starting with the long trail back toward the columns. Margaret and I were prepared for a long hike, but not for a 75-degree day. We were dressed for the typical overcast and chilly September weather in Ireland. We got pretty sticky. 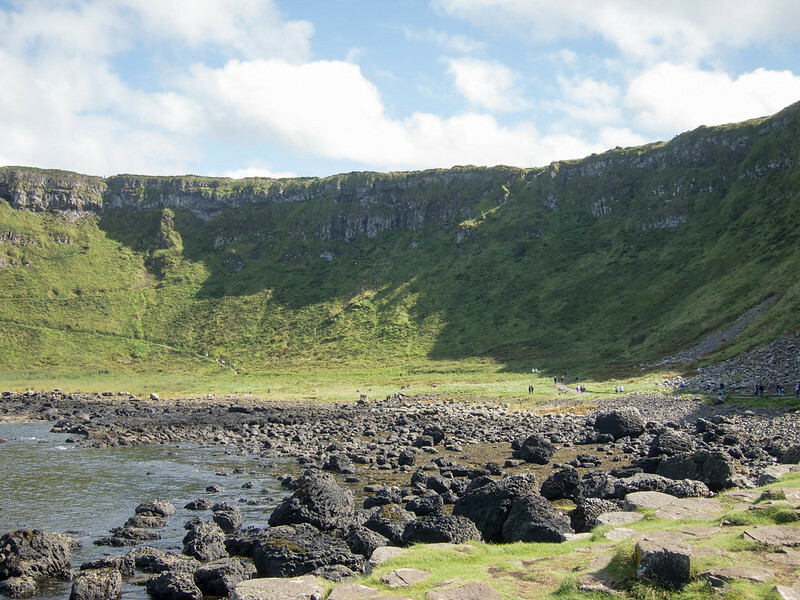 A warning, if you visit: you can go all the way up to the top of the cliffs, but to get there involves a lot of walking and some heavy stairs. 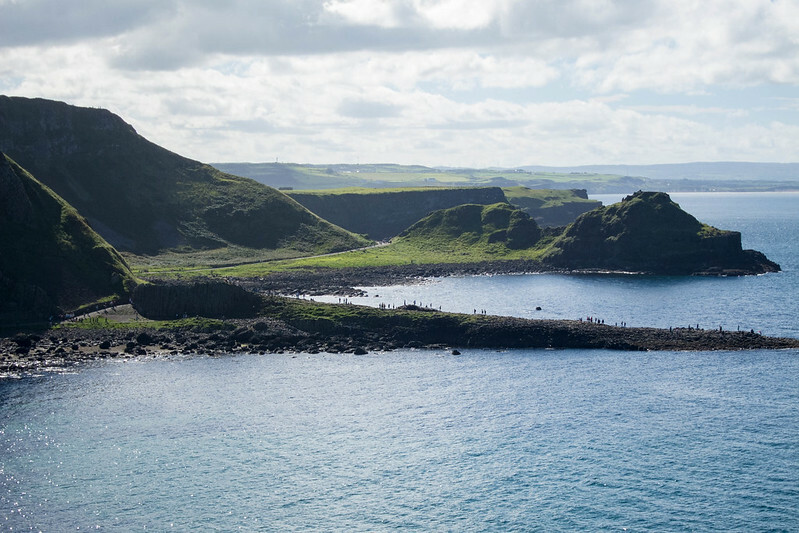 My iPhone tells me I walked 19,039 steps and climbed 42 flights of stairs on this day (but to be fair, this was also the day we visited Carrick-a-Rede Island). But the views from up there are worth it! You can see for miles from up there — all the way to Scotland. But even if you stay at ground level, the scenery never disappoints. 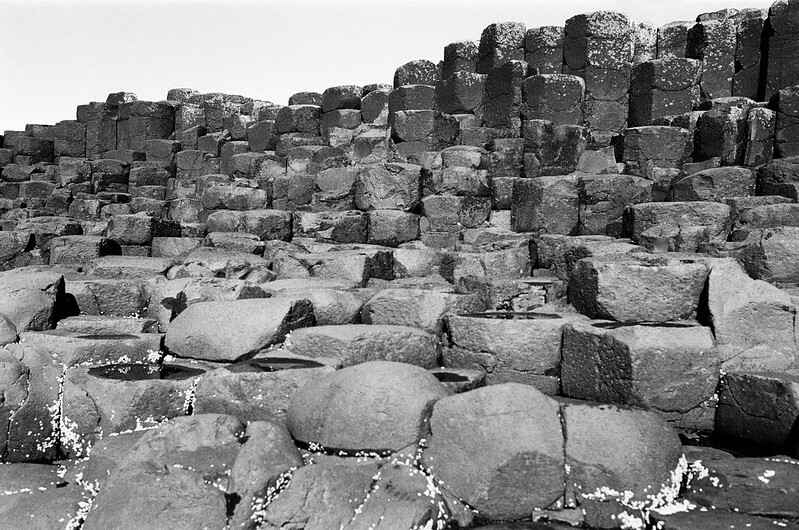 The views almost edge out the basalt columns as the star of the show. Almost. 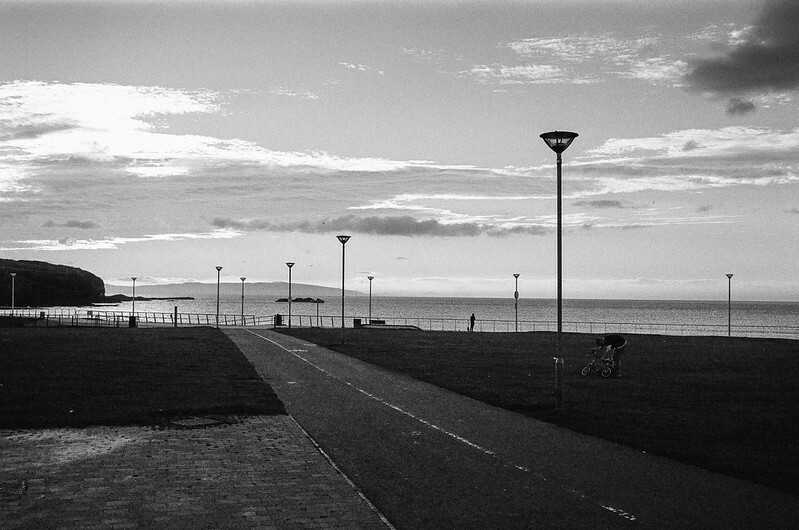 Canon PowerShot S95 and Nikon N2000, 35mm f/2.8 AI Nikkor, Kodak T-Max 400.